i wrote this article 2 years ago. it is still one of my driving forces behind my business and to this day, i am so glad i chose to do this! enjoy. hi. i am glad you're here. i hope this post makes sense to you + brings you even just a scrap of healing today. even if you are not struggling with instagram and you enjoy it every day, i want you to know that i am happy for you and i support you and i do not judge you. this is just my story with it. oh, and excuse poor grammar or typos. sometimes when i write my fingers cannot keep up with my brain and it turns into a crazy jumble. here i am making excuses...to be honest, i am nervous to share all of this. but here it goes. using instagram once a week began when god gave me the idea. i was sitting there, feeling bummed out because a photo i posted was not meeting my expectations of the number of likes i wanted (lol.......), and i clearly heard his voice telling me that social media cannot be a part of my every day life anymore. let me tell you now, i was freakin' against it. i was not into the idea. not one bit. so i didn't listen. and for another 6 months or so i struggled. you see, i kind of struggle with the comparison game. the completely debilitating, awful game that it is. and with that i fell further and further into my addiction with social media. there, i said it. addiction. cuz it was. i call it the 'stopped at a red light' addiction because i was checking instagram at times that one should absolutely not check instagram. like when you're stopped at a red light. ew. i knew i needed to change my habits. but the excuses kept piling on. and so did conviction. i needed to make a change, so i did. thank god i did. 1. solid, strong mental health comes first. always. if you're hurting/feeling incompetent/not good enough it's probably because you are saturating your mind with other people's best moments and forgetting about your own. we are not made to live this way + we do not need to feel this way. "i have the right to do anything,” you say—but not everything is beneficial. “i have the right to do anything”—but i will not be mastered by anything" (1 corinthians 6:12). this verse speaks a lot of truth about the things that hinder us. i can do anything i want, really. but i realized that this lifestyle of comparing myself to others constantly, being prideful, and being emotionally unhealthy is not what god wants for me. using instagram once a week has limited my ability to aimlessly scroll the app, comparing my life + my work to someone else's. i was not emotionally healthy when i was on instagram every day. now, i no longer wake up to the app, fall asleep to the app, and even better, no more red light instagram checks. its been amazing. its been freeing. and its allowed my mind to rest + let all that god has blessed me with sink in. by choosing to use instagram one day a week, my tendency to compare + feel incompetent has begun to fade. i'm filled with more gratitude than i've ever felt before. in the end, my mental health has to come first over having a "successful" instagram profile. 2. i wasn't a very good person when i was on instagram every day. jealousy, envy, pride, arrogance, laziness, anxiety, + fear were feelings i experienced every time i clicked that little purple button, usually all at once. rather than feeling excited for that person who took that gorgeous photo, i felt jealousy, mixed in with that feeling of needing to justify my work by putting theirs down (ahem, pride). posting photos on instagram began to be more prideful than joyful. rock bottom was hit, and i decided if i want to call myself a jesus follower, i better start following jesus. love, joy, peace, patience, kindness, goodness, faithfulness, gentleness and self-control (galations 5:22-23) are the things that are of jesus, and i was not feeling or exemplifying any of those when i was using instagram every day. do i like instagram? yes. is it healthy for me to have access to all the time? no. by limiting my social media usage, i've been learning how to love better, experience god's peace, and understand what self control means. i've had time to get to know jesus and his character. i'm focusing on the real world and its problems rather than my own trivial ones on my phone. giving up instagram was hard and it is hard. but i wouldn't trade my healing heart for anything. 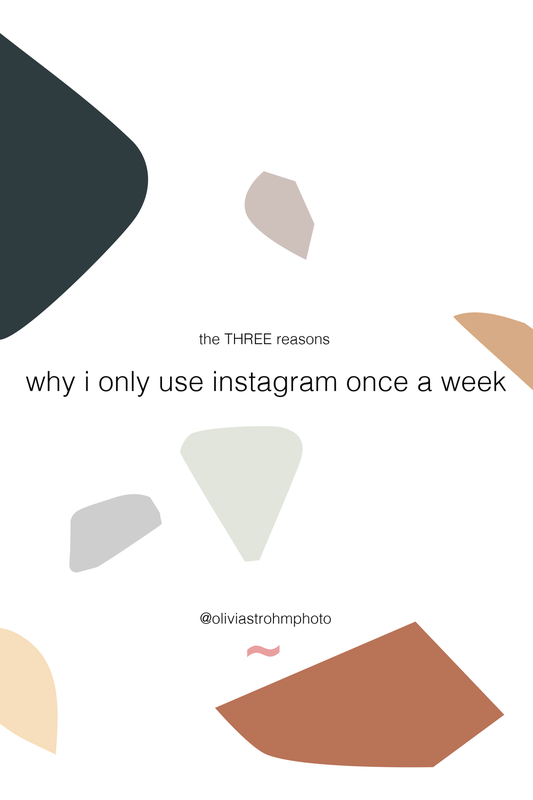 3. my relationship with instagram began to feel more of an addiction than something that was fun. this third point is simple. i use instagram once a week so i don't spend all my waking hours on it. breaking any addiction takes work and instagram is no different. i'll say it again. i like instagram. it's fun. it's quite enjoyable, actually. which is why i was addicted to it. what feels better than having people like what you are doing? what feels better than seeing people respond positively to your hard work? it feels pretty dang good. too good... i was not able to find my worth in anything other than the likes / followers. i got really caught up, and i was sad. i am so immensely blessed. but when i focus on the things that i want that i do not have, i forget that. and that's not okay. instagram unfortunately triggers my selfishness, and brings me farther away from the person that jesus wants me to be. i need to be "Giving thanks in all circumstances..." (1 Thessalonians 5:18), not wishing for more likes. not wishing for more followers. not wishing for *this type* of client. i decided i need to figure that out, do some soul searching, and heal up. limiting my instgramming has allowed that to happen. oh lord, i'm thankful. my deep need to be known cannot be met by my number of instagram followers. it is met by knowing i'm deeply loved + known by jesus. i want to encourage you to join me in using instagram once a week if you resonate with anything i've said. i want to give you a tangible aid to get your life back + your joy back. i just read that sentence over and felt a bit dramatic, but i am serious. you deserve to be unashamedly pumped about your work/life, always, without jealousy, fear, pride or anything negative. you were made with such purpose, such care, and such love. i believe that instagram is one of the most incredible apps there is - i love it, and i love what it has done to help my business flourish + lead some pretty freakin’ incredible clients to me. but i think if any ounce of you is feeling incompetent, unworthy, not good enough, prideful, anxious, jealous; it’s time to take a step back, and heal. we need to live our lives and stop curating them. we need to be the people jesus calls us to be... filled with attributes that are only formed out of love. if something like instagram is hindering you from feeling/being that, it's time to make a change. oh my goodness, the freedom that has flowed as i let the damn thing go. 1. pick a day you want to gram. i picked tuesday because the weekend is for shooting, monday is for editing some new work, and tuesday is for posting + sharing + interacting with followers/clients on instagram. please hear this before you think it's not possible: my profile engagement/business has not suffered from being off instagram. posting at the right time, engaging with your pods, posting hashtags + all of the other instagram tactics all can be done one day a week. 2. announce to your followers that you are doing this. why? because you've got instant accountability partners to keep you in line. if one of my followers saw me watching their story not on a tuesday, my word + integrity would be tarnished. not worth it. breaking any addiction is hard, and you're going to need support + accountability. 3. delete the app off of your phone every week. i upload the app tuesday mornings and delete it before i go to bed tuesday night. practice that self control!!! and remember to give yourself grace. this is going to be an adjustment. but it's going to be an amazing one. my friend. in the end, instagram won't come with us when we meet our creator. i keep telling myself i am worth more than my instagram profile. being a business owner in the social media age, this is really hard to grasp. some days i believe it and some days i really don't. but i am choosing to take the measures to get to that place where i am comfortable + content with being famous in god's eyes, first and foremost. i want that to be what matters to me most. so. long story short. that is why i instagram once a week. thank you for reading.